Have you ever played piano in the air or on your leg when listening to a good song? Do you like having the latest gadget and creating new songs? If the answers are yes, the perfect gadget for you is a nail instrument that works very similar to a piano. The idea is that you wear some plastic covers on your fingertips and a speaker on your wrist; this will create a specific noise when you tap the fingers on something and it is like playing an invisible piano. The concept is pretty cool and it also looks very nice with a very robot-like feel to it that will surely attract some attention when you start playing on the table. The wrist portion also has three buttons on it which allow you to choose between piano, bells or cat. The latter option seems to be a bit weird if you think about it but it can be fun to listen to cats while you tap your fingers on a hard surface. 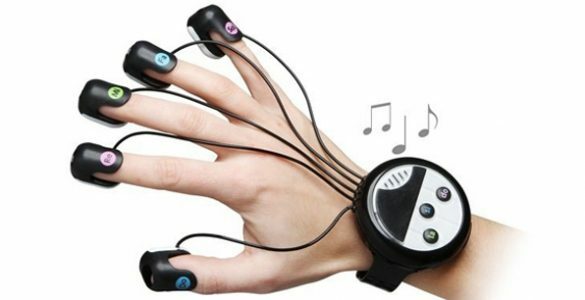 We have to mention that it is made in Japan and that it will cost $40 to have this new gadget on your hand and start playing some music in a very unique way. No matter if you are planning to buy this for yourself or as a gift for a friend who likes music, the results will be quite nice and it is a great gadget to have around the house for when you are bored or want to play some music. A piano is hard to fit in a house and no one really likes to play with actual bells or make cats speak for that matter; this leaves the Wrist-Mounted Finger Piano as the best choice. You can also consider getting two and start creating some beautiful music. Due to the fact that it is so portable, you can take it everywhere you want and even play some music in the bus; just make sure you practice a bit at home and know what you are doing before trying it out in public because most people don’t like the out of tune sound of cats.